Planet Bluegrass is a stunning venue that has all that you need for your perfect Colorado wedding. You can get married right next to a scenic river up against a towering redstone rock wall and large cottonwood trees. You might even see a few friendly people on inner tubes waving to you as they float by in the summer. Planet Bluegrass is better known as a music venue for its big summer festival, but it is at home as an idyllic spot for weddings. It's close enough to civilization and DIA, but far enough away that you feel like you are in the mountains and completely private. For photography there are lots of locations that work well as a backdrop, like the water tower with ivy climbing up, the majestic rocks surrounding the property, the St. Vrain River babbling by, and all the trees and natural features. 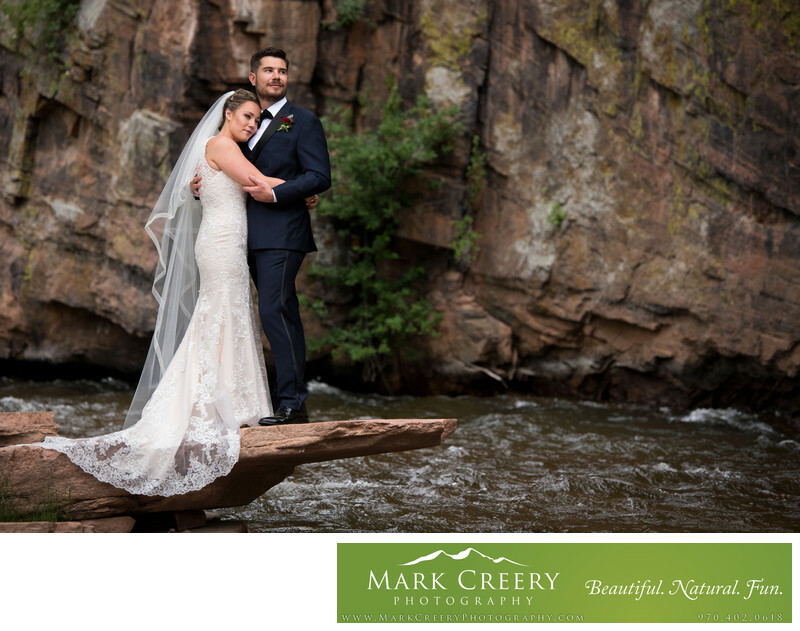 They even constructed a rock that protrudes dramatically over the river, which made this stunning photo of the bride and groom really come to life. The couple had their wedding in June and had an outdoor riverside ceremony followed by cocktails and then an outdoor reception among the trees. Their head table was right next to the river, with simple wildflowers in vases dotting the tables, which made for an amazing backdrop for photos of their toasts. Then they headed into the covered reception area for dancing and dessert. You can't really go wrong with this venue.